Earlier this year, my family and I went on a holiday to the Italian Alps. Many of you know that my “family holidays” often involve at least some working, since I never leave home without a camera and the temptation of photographing a new place is usually too much for me to resist. By now, my family expects this and understands that I am never completely on vacation. August 2018, additional exposures for highlights, focal length 22 mm, aperture f/11, shutter speed 4 seconds, ISO 64, tripod. After spending several lazy days swimming and sunbathing at Lake Garda, we moved on to the more arduous part of the trip, which involved hiking mountain trails in the Dolomites. 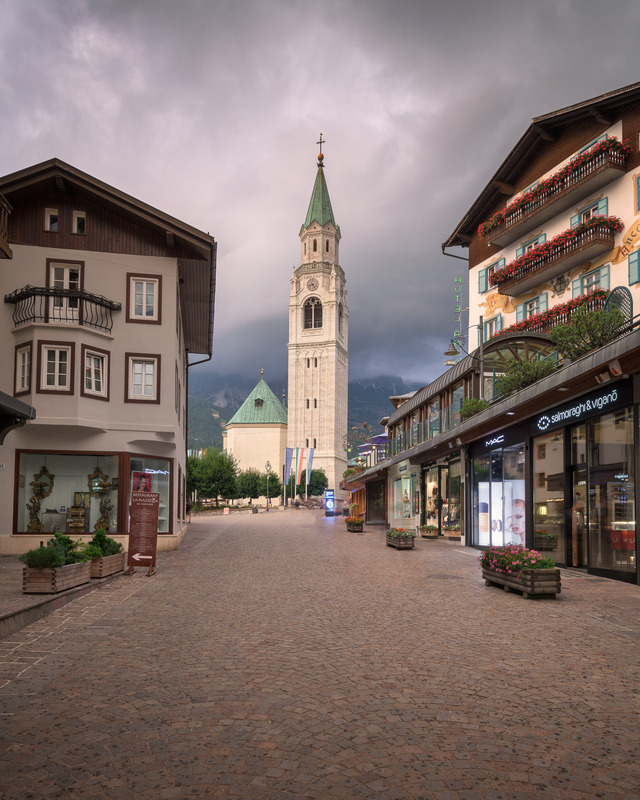 Before we ventured too far up the mountain trails, we spent a few days in Cortina d’Ampezzo, a ski resort town that is only a couple of hours from Venice but feels worlds away. Most people know Cortina, as it is commonly called, for its proximity to the slopes and the excellent skiing to be had there. But the transformation into a major ski destination has only happened comparatively recently in the town’s history, which is far longer than many people realized. This small town has a history stretching back some thousand years, and walking along its steeply winding streets, you get the sense that it was proud of its stunning natural beauty long before the skiers and tourists came and made it famous. So once again, I found myself on a family vacation, camera in hand, charmed by my temporary home. The spire of the Basilica Minore dei Santi Filippo e Giacomo is visible from almost any point in the town, and I naturally found myself drawn there. As luck would have it, it was a moody day and dark clouds were moving over Cortina. Few people were out, so I stopped and framed a shot with the spire as the focus. There are some modern elements in the photo, like the shops on the street, but I framed it this way to capture some of the town’s historic beauty. I like the idea of a proud little city that was here long before the skiers came. This entry was posted in City and tagged Cortina d'Ampezzo, Dolomites, Italy.